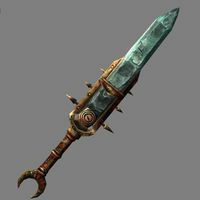 Kagrenac's Tools are the legendary artifacts crafted by the Dwemer Tonal Architect Lord Kagrenac. The tools, Keening, Sunder, and Wraithguard, were created to tap into the power of the Heart of Lorkhan via tonal manipulation of the laws of nature. The artifacts were seemingly misused by the Dwemer, leading to the race's disappearance. All three artifacts came into the possession of the Almsivi following the Battle of Red Mountain and were used by the Tribunal to make themselves into living gods. In 2E 882, Dagoth Ur awakened and then ambushed and nearly killed the Tribunal during their annual pilgrimage to Red Mountain to renew their divine powers. The event resulted in the Tribunal being cut off from access to the Heart of Lorkhan. The Tribunal then launched intermittent campaigns to assault Red Mountain to force access to the Heart Chamber, and Keening and Sunder were lost during a campaign in 3E 417. In 3E 427 the Nerevarine retrieved all three artifacts and during their final battle with Dagoth Ur, all three were used to destroy the enchantments on the Heart of Lorkhan. In 4E 201, the Dragonborn retrieved all three artifacts, although their enchantments that kills the wielder seemed to had faded. Each tool had a specific purpose in helping gain power from the Heart. Without Wraithguard, it is dangerous to wield the weapons, often leading to the instant death of the wielder. Sotha Sil created his own versions of the tools to control, shape, or dismantle his own variant of the Heart of Lorkhan, the Mechanical Heart. He hid his tools as a precaution across Nirn to prevent people from stealing the Heart's power. The location was lost after his demise—though some tales describe a Forgotten Hero reclaiming them. King Orgnum's Coffer is a small-sized chest, ordinary in appearance. It is remarkably light, almost weightless, which offers a clue to its true magic. Once a day, the Coffer will create gold from naught. When King Orgnum himself possessed the Coffer, the supply within was limitless. Those who have found it since report that the Coffer eventually disappears after having dispersed enough gold to shame even the wealthiest of merchants. Where and why it vanishes is still a mystery. It was last seen in the hands of the Eternal Champion. This page was last modified on 17 January 2019, at 13:35.